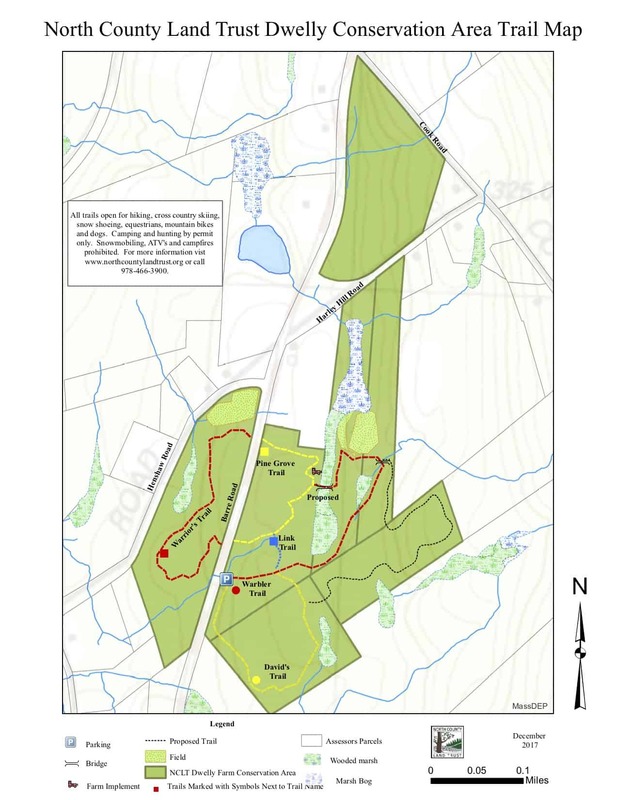 North County Land Trust is grateful for the generosity of David Dwelly who bequeathed this 68-acre conservation area to the land trust. He died tragically in 2010 from cancer at the age of 44. Dwelly Farm was home to the Dwelly Family for almost 100 years and, in his will, David devised the farmland to North County Land Trust, excluding the house and five acres. NCLT conveyed a permanent Conservation Restriction to the Town of Templeton. In return, NCLT received funding from the Community Preservation Fund to help manage the farm for passive recreation and to maintain the fields in a condition for agriculture. Walter Dwelly purchased the land in 1912. At the end of World War 1, the family became full time farmers, with eight dairy cows. By the early sixties, small local dairy farms were dying out, as milk revenues failed to match production expenses. The government responded by creating the Federal Soil Bank Program, which paid farmers to idle their lands for 10 years. The Dwelly family declined to sell but eventually they were unable to stay in business. By 1969 the last dairy cows had been sold. Although much of the cleared farmland has now reverted to forest, evidence of the land’s agricultural past can be seen in the remaining cleared fields and remnants of old farm equipment that can be seen on some of the trails. North County Land Trust is committed to maintain the viability of the agricultural land by keeping them open. Although there is no demand for their use in agriculture at this time, the land trust’s crop with be a healthy diversity of native pollinator plants that will benefit wildlife. 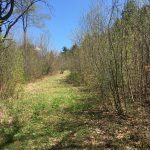 The property has a diverse mix of pine groves, hemlock forest, early successional birch (and unfortunately Glossy Buckthorn) and open fields. The long-term management goals for the property are to remove the invasive plants and introduce or enhance native plants wherever possible. The land is open for multi-use recreation for all to enjoy. Download the Dwelly Farm Conservation Area PDF Map or see the online map below. Camping is for non-profit educational groups and by permit ONLY.